Where do I use my Honest Brew voucher code? Honest Brew work with a huge selection of breweries including Beavertown, Cloudwater, Northern Monk, Siren, Wylam, Buxton, Wild Beer Co and Magic Rock to provide high-quality beer that you’ll love. Shop around and discover different styles of beer like IPA, Pale ale, Lager, Stout, Sour and Wild beer from regions like Europe, the UK, the US and Australia. You can even buy office beers and get your drinks delivered to your workplace for you and your colleagues to enjoy. If you’re looking for mixed cases of beer you can find tons for affordable prices including bestselling cases like craft beers, IPA cases and best of British cases. Other mixed cases include beer style cases, gift beer cases and special mixed cases, all of which make great presents for loved ones that love a drink. You can also shop for three packs of beers and find packs like Hoppy Heaven, Mighty Mix and Beavertown. Treat a friend or a loved one with a craft beer gift, case or three pack from Honest Brew. Discover corporate gifts, birthday beers, thank you gifts and beer gifts for a beer geek all from under £20. You can also shop for gift subscriptions and gift vouchers that’ll make great presents for alcohol lovers and beer fanatics. Discover IPA cases, winter collection beers, party beers, introductory beer cases, vegan beer cases, traditional beer and cases and more, all of which can be offered as gifts, with free delivery on orders over £50. Browse for your gifts via price range, style and brand and discover great products that you and your loved ones will love. 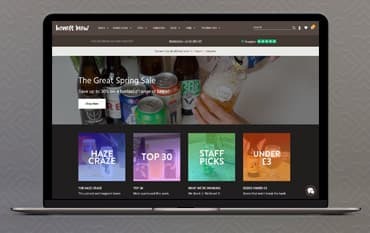 If you’re looking for help when it comes to buying your beer then check out the read ‘Brew Banter’ section on the Honest Brew website. Read the Honest Brew magazine and discover the latest beer stories, check out the nominees and winners for the beer awards and celebrate craft beer diversity in the women in beer section. In this section, you can also read style guides for beers as well as Honest Brews’ unique beer bible and their special brewery guides. Discover new guides every week and stay up to date on all the latest styles of beers and must know information in the beer industry too. How can I contact Honest Brew? What are the sizes of the beers? Honest Brew sends a mixture of bottles and cans. The most common size is 330ml, but many US beers are 355ml and then there’ll be the occasional 440ml or 500ml as well. Honest Brew supply beer from hundreds of independent producers, sourcing only the best from around the world. Working directly with breweries, Honest Brew guarantees only the freshest and highest quality products. Shop for beer, mixed cases and gifts or subscribe for monthly beer deliveries and enjoy discounts of 10% with exclusive members benefits. If you don’t want to subscribe and become a member you can still enjoy great savings on all your beer by using an Honest Brew coupon code from us when you shop online.